After gaining a first class degree in Human Nutrition in Germany (1999), Brigitte completed her PhD at the University of Glasgow (2003), investigating absorption, metabolism and body distribution of flavonoids using radiolabelled quercetin (Prof. Mike Lean, Prof. Alan Crozier). After her postdoc at the Antioxidants research lab (Prof. Jeffrey B. Blumberg) at the USDA Human Nutrition Research Center on Ageing at Tufts in Boston (US), Brigitte joined Unilever R&D (Vlaardingen, The Netherlands) as a Bioavailablity Research Scientist, focusing on absolute bioavailability, body distribution and metabolic transformation of potentially bioactive food ingredients (2006-2010). 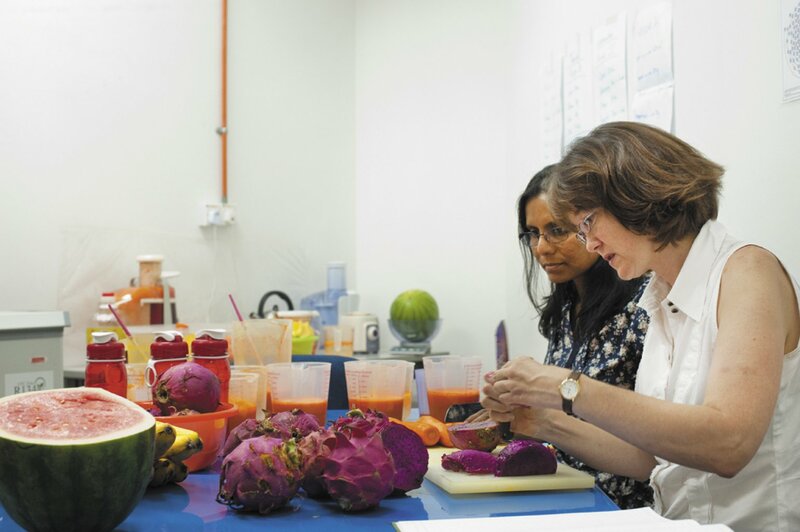 Before Brigitte accepted an Associate Professorship at the University of Nottingham Malaysia Campus (2012), she served as advisor and appointed German delegate to support scientific cooperation between the European Food Safety Authority (EFSA) and national scientific institutions within Germany. Since summer 2015 Brigitte works as Senior scientist at MMU. Her current research interests focus on the question whether bioactive food ingredients (or their metabolites) are absorbed and subsequently transported to proposed target organs where a biochemical effect might occur. 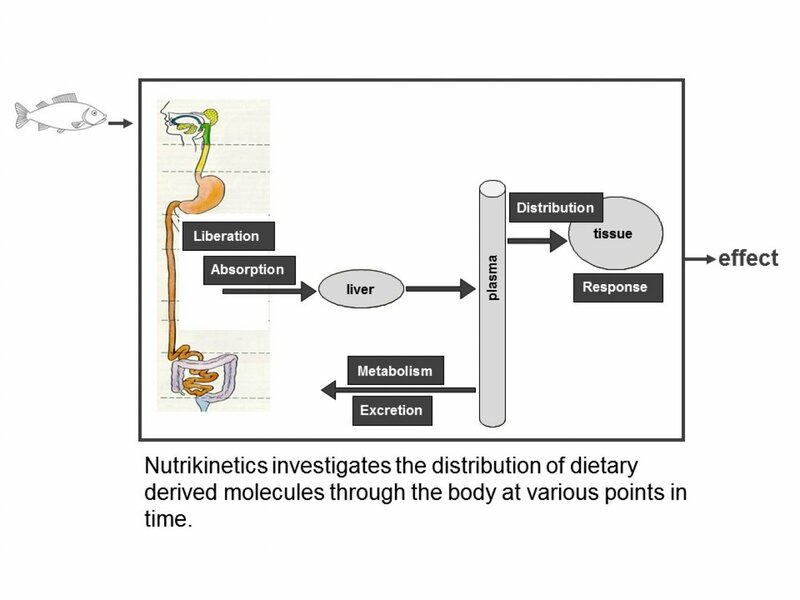 A better understanding of the journey of nutrients through the body (Nutrikinetics) will support nutrition studies aiming to show cause effect of bioactive food ingredients. Why study Molecular Nutrition and Biochemistry? Because it is really interesting to understand how food is converted into energy within us, or how exactly different types of foods can influence health? two-step salt density gradient ultracentrifugation. carotenoids in underutilised Malaysian fruits, using HPLC-DAD analysis. vehicle for the determination of recently absorbed carotenoids and vitamin E? physiological, biochemical and traditional Chinese medicine (TCM) outcomes. There is one area where food industry, regulatory bodies and nutrition scientists have a common interest. It is the question of cause-effect relationship in nutrition research: is a specific health outcome correlated with a specific nutrient, a whole food or a food constituent? A new approach, called “nutrikinetics”, may assist nutrition research to design human intervention trials with more accuracy. If a food constituent is causing a health beneficial biological effect in a specific tissue or organ, the active molecule must have physically reached this tissue (or its active metabolite). Nutrikinetics investigates questions such as: Does a proposed bioactive arrive at proposed site of action? Is the active compound a metabolite? Does the presence of a proposed bioactive coincide with a measured biochemical effect? It also needs to be considered at what point in time the bioactive is present and at what point in time the biochemical effect occurs. Three previously applied nutrikinetic approaches and their results are critically discussed during the presentation. In the development of functional food, food supplements, medicinal food, optimised food for the elderly population and also for cost-optimized food in developing nations, good absorption of functional ingredients is of great interest. If the kinetics and body distribution of nutrients (or bioactives) are known, better choices can be made in nutrition intervention trials with regards to dose and duration of the intervention and time point when to collect which biological sample. Key Words: Nutrient absorption, Bioavailability, Body distribution, Metabolism, Nutrikinetics. EMS. Robertson, GH. Evans, B. Graf (2018). Absorption of lipophilic micronutrients from smoothie. In: Proceedings of the Nutrition Society. Leeds, UK, 10/7/2018. KW. Tan, BA. Graf, SR. Mitra, ID. Stephen (2017). 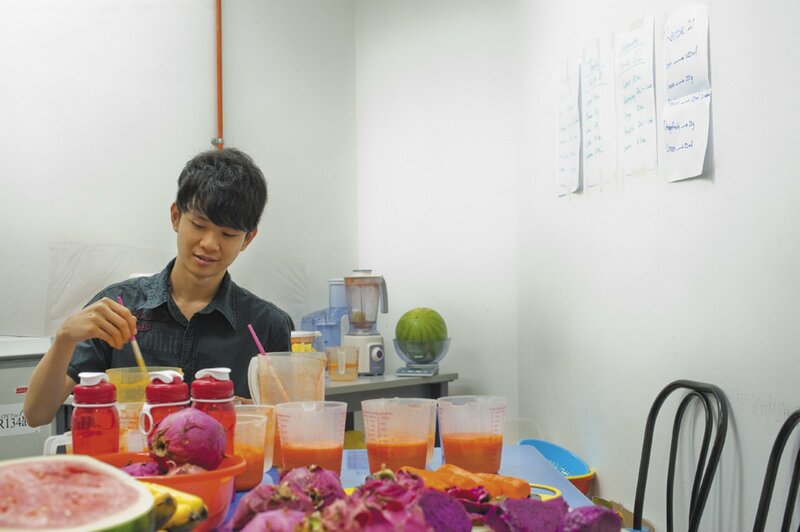 Impact of fresh fruit smoothie consumption on apparent health of Asian faces. Evolution and Human Behaviour. 38(4), pp.522-529. BA. Graf, CJ. van Platerink, GAM. Ten Have, NEP. Deutz, KP. Velikov, et al. LM. Flendrig, SM. Melnikov, UM. Garczarek, SL. Abrahamse, GSMJE. Duchateau. (2011). Absolute bioavailability of a Hoodia gordonii steroid glycoside from different physicochemical formats in the pig. Journal of Functional Foods. 3(3), pp.135-143. BA. Graf, GSMJE. Duchateau, AB. Patterson, ES. Mitchell, P. van Bruggen, et al. JH. Koek, S. Melville, HJ. Verkade. (2010). Age dependent incorporation of 14C-DHA into rat brain and body tissues after dosing various 14C-DHA-esters. Prostaglandins Leukot Essent Fatty Acids. 83(2), pp.89-96. W. Kalt, JB. Blumberg, JE. McDonald, MR. Vinqvist-Tymchuk, SAE. Fillmore, et al. BA. Graf, JM. O’Leary, PE. Milbury. (2008). Identification of Anthocyanins in the Liver, Eye, and Brain of Blueberry-Fed Pigs. Journal of Agricultural and Food Chemistry. 56(3), pp.705-712. BA. Graf, C. Ameho, GG. Dolnikowski, PE. Milbury, C-Y. Chen, et al. JB. Blumberg. (2006). Rat gastrointestinal tissues metabolize quercetin. J Nutr. 136(1), pp.39-44. BA. Graf, W. Mullen, ST. Caldwell, RC. Hartley, GG. Duthie, et al. MEJ. Lean, A. Crozier, CA. Edwards. (2005). Disposition and metabolism of [2-14C]quercetin-4'-glucoside in rats. Drug Metab Dispos. 33(7), pp.1036-1043. BA. Graf, PE. Milbury, JB. Blumberg (2005). Flavonols, flavones, flavanones, and human health: epidemiological evidence. J Med Food. 8(3), pp.281-290. KJ. Henning, BA. Graf, S. Kaus, G-F. Boel (2011). EU Food Safety Almanac, 2nd edition. BA. Graf. Federal Institute for Risk Assessment (BfR). CJ. van Platerink, H-GM. Janssen, B. Graf, L. Abrahamse, J. Haverkamp (2011). Quantification of steroid glycosides from Hoodia gordonii in porcine plasma using high performance liquid chromatography-mass spectrometry. J Chromatogr B Analyt Technol Biomed Life Sci. 879(11-12), pp.819-825. PE. Milbury, B. Graf, JM. Curran-Celentano, JB. Blumberg (2007). Bilberry (Vaccinium myrtillus) anthocyanins modulate heme oxygenase-1 and glutathione S-transferase-pi expression in ARPE-19 cells. Invest Ophthalmol Vis Sci. 48(5), pp.2343-2349. BA. Graf (2004). Dietary flavonoids. The World of Food Ingredients. 3, pp.50-53. W. Mullen, BA. Graf, ST. Caldwell, RC. Hartley, GG. Duthie, et al. CA. Edwards, MEJ. Lean, A. Crozier. (2002). Determination of flavonol metabolites in plasma and tissues of rats by HPLC-radiocounting and tandem mass spectrometry following oral ingestion of [2-(14)C]quercetin-4'-glucoside. J Agric Food Chem. 50(23), pp.6902-6909. V. Lirås, M. Lindberg, P. Nyström, H. Annadotter, LA. Lawton, et al. B. Graf. (1998). Can ingested cyanobacteria be harmful to the signal crayfish ( Pacifastacus leniusculus )?. Freshwater Biology. 39(2), pp.233-242. GMR. Gonçalves, L. Zhao, S. Patel, B. Graf (2018). Effect of Goji berry consumption on physiological, biochemical and traditional Chinese medicine (TCM) outcomes. In: Abstract will be published in the Proceedings of the Nutrition Society. Leeds, 10/7/2018. KH. Ng, M. Maqbool, FS. Ong, BA. Graf (2017). Understanding underutilisation of locally grown tropical fruit and vegetables – why are imported apples preferred in Malaysia?. In: Proceedings of the Nutrition Society. Dublin, Ireland, 10/7/2017. pp.E149-E149. BA. Graf (2014). Evaluation of the bioactivity of constituents in fruit and vegetables using nutrikinetic approaches. Kuala Lumpur, Malaysia, 1/8/2014. BA. Graf (2014). Value of nutrikinetic approaches for the elucidation of bioactivity. Wageningen, The Netherlands, 1/3/2014. V. Shipp, M. Flintham, R. Mortier, BA. Graf, M. Maqbool, et al. B. Parhizkar. (2013). Understanding underutilisation: Methods for studying fruit and vegetable buying behaviours. In: UbiComp 2013 Adjunct - Adjunct Publication of the 2013 ACM Conference on Ubiquitous Computing. pp.571-574. SR. Mitra, KW. Tan, BA. Graf, ID. Stephen (2013). Dietary assessment of macronutrient and carotenoid intake in young Chinese Malaysian students. In: Malaysian Journal of Nutrition. Kuala Lumpur, Malaysia, 1/5/2013. SA. Affendi, KW. Tan, ID. Stephen, SR. Mitra (2013). Design of a carotenoid rich fresh juice for use in a human intervention study. In: Malaysian Journal of Nutrition. Kuala Lumpur, Malaysia, 1/5/2013. BA. Graf (2013). Nutrikinetics: Journey of Nutrients through the Body. In: Malaysian Journal of Nutrition. Kuala Lumpur, Malaysia, 1/5/2013. BA. Graf (2011). Tasks and activities of the EFSA Focal Point in Germany. Perugia, Italy, 1/6/2011. BA. Graf (2011). Who is who in food and feed safety – authorities and agencies in EU member states. Luxembourg, 1/5/2011. BA. Graf (2011). Objectives and outcome of the third German EFSA Focal Point meeting. Parma, Italy, 1/2/2011. BA. Graf, S. Kaus, HK. Henning (2010). BfR project: EU Food Safety Almanac. Budapest, Hungary, 1/10/2010. BA. Graf (2006). Radiochemical detection in metabolism research. Amsterdam, The Netherlands, 1/11/2006. PE. Milbury, BA. Graf, JB. Blumberg, JM. Curran-Celentano (2006). Effects of bilberry anthocyanins on apoptosis and oxidative stress-induced responses in cultured retinal pigment epithelial cells. In: FASEB Journal. pp.A1001-A1001. PE. Milbury, BA. Graf, JB. Blumberg, W. Kalt (2006). Analysis of anthocyanins in tissues of pigs fed blueberries (Vaccinium corymbosum). In: FASEB Journal. pp.A550-A550. BA. Graf, PE. Milbury, C. Ameho, GG. Dolnikowski, JB. Blumberg (2005). Metabolism of dietary quercetin in the gastrointestinal tract, liver and kidney of the rat. In: Journal of the American Chemical Society. San Diego, CA, USA, 1/3/2005. BA. Graf, PE. Milbury, CK. Ameho, T. Li, GG. Dolnikowski, et al. JB. Blumberg. (2004). Gastrointestinal tissues of the rat metabolize dietary quercetin. In: FASEB Journal. Washington DC, U.S., pp.A516-A516. BA. Graf, R. Wilson, ST. Caldwell, RC. Hartley, MEJ. Lean (2003). Metabolism of dietary quercetin-4'-glucoside by cultured liver and intestinal cells. In: Proceedings of the Nutrition Society. 1/4/2003. pp.6A-6A. BA. Graf, W. Mullen, ST. Caldwell, RC. Hartley, GG. Duthie, et al. MEJ. Lean. (2002). Disposition and metabolism of dietary quercetin-4'-glucoside in the rat. Sandwich, UK, 1/9/2002. BA. Graf, W. Mullen, ST. Caldwell, RC. Hartley, GG. Duthie, et al. MEJ. Lean, A. Crozier. (2002). Fate of quercetin-4'-glucoside in the rat. In: Free Radical Research. Cambridge, U.K., 1/9/2002. pp.A94-A94. W. Mullen, BA. Graf, ST. Caldwell, RC. Hartley, GG. Duthie, et al. CA. Edwards, MEJ. Lean, A. Crozier. (2002). Identification of metabolites of [2-14C]quercetin-4'-glucoside in rats by HPLC-MS/MS with on line radioactivity detection. Salamanca, Spain, 1/4/2002. JL. Quiles-Morales, B. Graf, A. Farquharson, DK. Simpson, I. Grant, et al. S. Heyes, KJW. Wahle. (1998). Olive oil and human health - Plenary lecture. Bangkok,Thailand, 1/9/1998. A. Farquharson, JL. Quiles-Morales, B. Graf, DK. Simpson, I. Grant, et al. S. Heys, KWJ. Wahle. (1998). Olive oil and its constituents in human health - Plenary lecture. Madrid, Spain, 1/7/1998. A. Farquharson, HC. Wu, I. Grant, B. Graf, JJ. Choung, et al. O. Eremin, S. Heys, KWJ. Wahle. (1998). Possible mechanisms for the putative anti-atherogenic and anti-tumorigenic effects of conjugated polyenoic fatty acids. Lyon, France., 1/6/1998. LA. Lawton, JA. Stewart, B. Graf, BA. McGaw (1995). Characterization of algicidal components of rotting barley straw used in the control of cyanobacterial blooms. Ronne, Denmark, 1/8/1995.